Pork Belly Burnt Ends is an elusive bite of deliciousness well worth the effort. 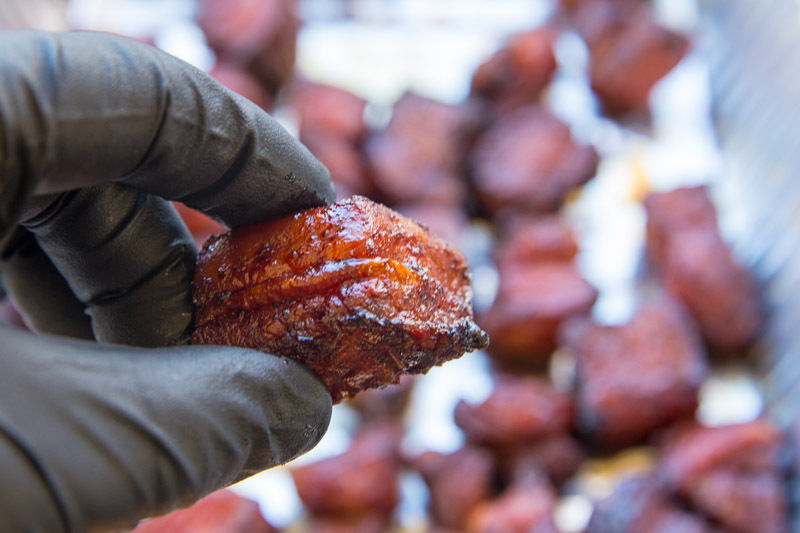 Combining your favorite rub, BBQ sauce, and cut of pork together into a slow and smoky bite of goodness is easier than you think. This recipe was conceived using a Big Green Egg but you can use any smoker to get the same result. Now sit back, grab a nice glass of Shiraz, and enjoy this recipe for Pork Belly Burnt Ends. I have found locating a pork belly is half the battle. For this cook, I found a nice piece of pork belly at my local Costco. Prep the pork belly by trimming the excess fat and silver skin from the meat side. Doing this allows the rub to contact the meat directly. Slice and cut the pork belly into 1″ cubes. Using mustard as a base toss the pork belly pieces with your favorite rub (for this cook, I used Meat Church’s Honey Hog ). Place the cubes of pork belly covered in the rub on a wire rack and set aside while you prep your Big Green Egg. Preheat the Big Green Egg to 275° using a ConvEGGerator for indirect cooking. Once the Big Green Egg is up to temp, add some chunks of Hickory wood, and place the rack of rubbed pork belly pieces inside. Let the pork belly smoke for 3 hours spritzing the pieces every hour with apple juice. At the 3-hour mark, check the internal temperature of your pork belly, and once it hits 190° internally it is time to pull from the Big Green Egg and place into an aluminum pan. Pour your BBQ sauce into the pan filled with the smoked pork belly burnt ends and toss to coat evenly. Now top the pork belly off with a generous drizzle of honey, a few hunks of butter, wrap the pan with foil, and place the pan back into the Big Green Egg to cook for another 1 – 1.5 hours. Once the sauce reduces and has caramelized nicely on the pork belly pieces, it is time to pull them out of your BGE and serve. This recipe takes some time but is easy to do. Have patience as this dish is well worth the time it takes! Pork Belly Burnt ends are the most delicious piece of BBQ you will ever put in your mouth. Getting this elusive bite of deliciousness is doable if you have patience.